So what's a Heart and Stroke Foundation Health Check again? "When you shop, look for the Health Check symbol. It's a simple tool to help you make food choices that are part of a healthy diet. Every food with the Health Check symbol has been evaluated by the Heart and Stroke Foundation's dietitians to make sure it is part of a healthy diet." So what foods have Health Checks? In the past I've posted about the Health Check on red meat, a food that study after study identifies as a major health risk - from breast cancer (in post-menopausal women, intake of just 60 grams per day increased their risk of breast cancer by 57%), to colon cancer (people who ate the most red meat were almost 40% more likely to develop colon cancer), to diabetes (for every increase in the number of daily servings of red meat there was a 26% increase in the risk of developing diabetes). I've posted about the Health Check on chocolate muffins for children where the 8 teaspoons of sugar per muffin literally make up a third of the muffin's weight. I've posted about the Health Check on French fries and even putting aside the horrifying contradiction of a Heart and Stroke Foundation recommending that we consume French fries, potatoes increase blood sugar and insulin levels nearly as fast as pure white table sugar which is potentially why in a 20 year study looking at 84,555 women there was an increased risk of type II diabetes in women with higher potato consumption. I've posted about the Health Check on refined white flour, a substance that dramatically increases the risk of developing metabolic syndrome. I've posted about the Health Checks on restaurant foods where they have endorsed foods with a full day's worth of sodium. Lastly I've posted about the Health Check on "natural" sugar where they endorsed a juice product that effectively is a glass of water, sweetened with 10.5 teaspoons of sugar, along with a smattering of vitamins. Today I've got one more. The Health Checked beverage that contains 600mg of sodium in just two thirds of a cup. It's called V8Go Smooth and Seasoned. Let me ask you, putting aside for a moment the fact that it's just mind-bogglingly stupid for the Heart and Stroke Foundation to be endorsing a product where in 2/3rds of a glass you'll get over half their recommended daily sodium intake, how many folks out there are only going to pour 2/3rds of a glass? Fill your glass and now you'll get 961mg of sodium - almost a full day's worth. Unbelievably, it gets worse. While I've always held out hope that this was all reflective of a woeful lack of oversight by the Heart and Stroke Foundation on their arm's length Health Check program, last week I realized this wasn't the case. 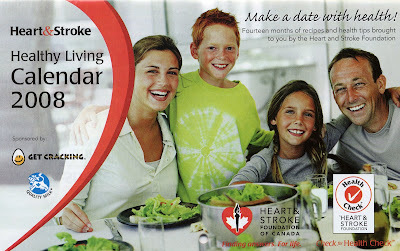 Last week I received the Heart and Stroke Healthy Living Calendar 2008. "Make a date with health! Fourteen months of recipes and health tips brought to you by the Heart and Stroke Foundation"
So would you assume that all the recipes therein are healthy? Let's look at two (click 'em for enlargements). According to the Heart and Stroke Foundation's recipe, it's made with butter, 1% milk and is that really 3tbsp of soy sauce? Did you know that soy sauce, per tablespoon, has 335mg of sodium? Did you know that there was such a thing as light soy sauce with less sodium? 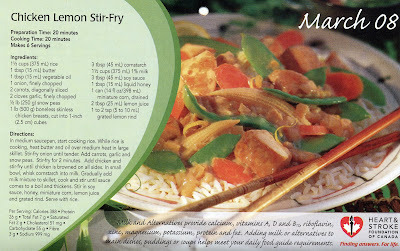 Did you know that each serving of this stir-fry has 999mg of sodium?! Do you think maybe the vegetables could have been stir-fried in a non-stick wok with a few sprays of cooking oil rather than a tablespoon each of butter and oil? Can you believe that that Heart and Stroke Foundation just suggested butter was a healthy choice to cook with? Also, isn't there such a thing as skim milk? Next let's look at the Superb Rigatoni and Cauliflower Au Gratin. Once again the Heart and Stroke Foundation's recipe includes a tablespoon of butter, a tablespoon of vegetable oil and 3 cups of 1% milk. 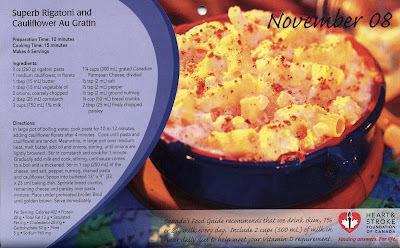 This Heart and Stroke Foundation endorsed recipe gives you 965mg of sodium per serving. To put these sodium numbers back into perspective, here are the Heart and Stroke Foundation's recommended sodium targets published in the National Sodium Policy Statement they co-released last week. I can't think of enough adjectives to describe just how plain wrong it is for the Heart and Stroke Foundation to be endorsing these unhealthy choices as good for you. If I were working at the Heart and Stroke Foundation, heads would roll. But I'm not done. Stay tuned for tomorrow when we'll talk about how the Heart and Stroke Foundation pushes junk food on your children.